Ross would really like to focus on reopening his mine, but all these ridiculous family dramas keep getting in the way! Welcome to Ross’s Pity Party! Jim, the poacher we barely got to know, dies, and Ross is so upset about it he becomes a horrible, selfish, drunk, insulting, stupid jerk who does all he can to ensure he goes to prison and leaves his wife and kid destitute. Our hero, ladies and gentlemen! Ross leads a band of hungry people down to the beach to pick clean a wrecked ship, which ends up going very badly for him. But not as badly as what happens when Demelza goes to help Francis’s family when they fall ill.
Ross acts so Ross-y (and George is so insane) he winds up in prison facing an almost certain guilty verdict. It’s time for Ross’s trial! Gee, do you think he’ll be hanged? Things have been looking up for Francis, who totally has a new lease on life! Which means it’s time for something terrible to happen to him, right? Look Up and You’ll See Rock Bottom! 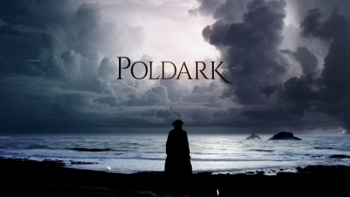 Poldark: Demelza considers revenge, Elizabeth worries and wonders what to do, George gleefully wedding plans, and Ross gets super lucky. Again. Ross’s plan to expand the mine doesn’t go well, Whitworth has horrible plans for Morwenna, George seems set to return to Westminster, and Caroline and Enys bid farewell to their tiny daughter. This was… not a happy episode. Ross returns to Cornwall just in time to ride to Pascoe’s rescue, of course. George schemes, Elizabeth hides morning sickness, Rosina forgives, Demelza makes a mess of trying to fix things, and poor Morwenna just can’t win.